Happy Thanksgiving, everyone! I hope your week is full of delicious food and wonderful company. 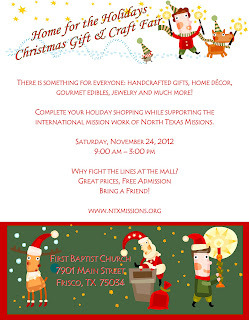 "The annual Home for the Holidays Craft Fair is a major annual fundraiser for the local and international work of North Texas Missions. This event is open to the public and attracts hundreds of shoppers eager to find early Christmas shopping bargains. Your participation as a vendor, shopper or volunteer is greatly appreciated." "Lady Jane's Flowers and Gifts is hosting a Vendor Fair! With our abundance of vendors and our Flowers and Gifts, we hope that you will be finished with your holiday shopping. Lady Jane's will have a gift wrapping services available as well if you want to get your wrapping out the way as well. " "This is a new flea market that will occur every Fri-Sun. starting Black Friday weekend." "Junk In The Trunk is a community wide resale event on the historic town square of Waxahachie. Vendors will be selling antiques, crafts, and baked goods!"